It’s sort of ridiculous how huge gift card programs are — Americans spend some $100 billion on them each year, and they’re now offered by myriad physical stores and online companies (like Zynga) alike. One reason why they’re so popular is that they give people who can’t get credit cards — like, say, millions of teenagers — a way to purchase goods online. Thing is, gift cards tend to be pretty restrictive, as they generally can only be used at one chain. Openbucks, a startup that’s launching at the TechCrunch Disrupt Battlefield, is looking to change this: they’re creating what they’re calling a ‘universal payment network’, that lets you use gift cards to buy goods and services online — in other words, you could use your Subway gift card to rent a movie, or buy some virtual goods. To do this, the company is partnering with brands — they have six to start, including Subway, CVS, Circle K, Sports Authority, Hess and CITGO. 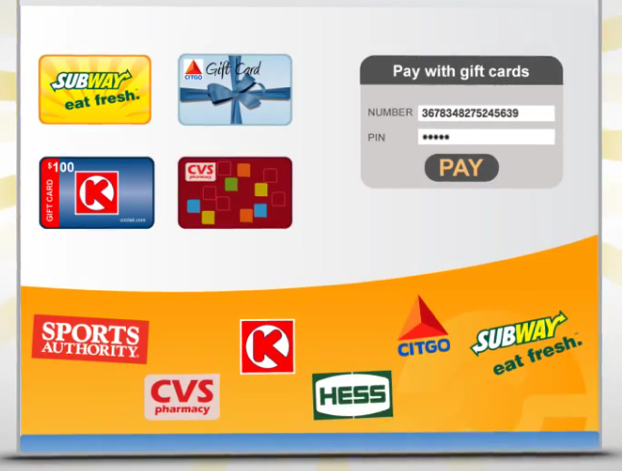 If you buy one of these gift cards and head online to a supported site, you can use the card to purchase digital goods. You can spend whatever value was stored on the card — there’s no exchange rate that depends on where you bought it. You enter the number on your gift card, hit submit, and you’ll get a receipt for the transaction, just like if you had used a credit card. The difference, of course, is that it isn’t a credit card — it’s a gift card that any one can buy with cash at one of the supported retailers. Retailers benefit because of increased foot traffic (teens will head over to Subway or CVS to buy gift cards so that they can buy things online), and online services will boost the number of users they’re receiving money from. Right now a variety of gaming companies, like Mochi, Gaia Online, and BigPoint, are accepting these cards as payment, and the company plans to extend this to more digital goods in near future. TC: Not sure I get the why. Why do I use my Subway card, why would I get one to pay for games online? A: Vast majority of US teenagers can’t buy online easily. They have to ask permission, and we want to bring freedom by offering a card that isn’t issued by a bank — anyone can walk into a store and pick a card. BG: Two huge thumbs up, I would invest. SM: There’s something so simple and genius about it. An anonymous way to pay for whatever they want. I worry about hard goods, might have threft or fraud. Disclosure: TechCrunch founder Michael Arrington has a pending investment in the company via CrunchFund.